Just recently a new range of jewellery has been created in the Design Studio on the Reservation in New Mexico. And it's divine! Classic, elegant and timeless like the rest of the Navajo range, but this time there's a fantastic buzz of colour. 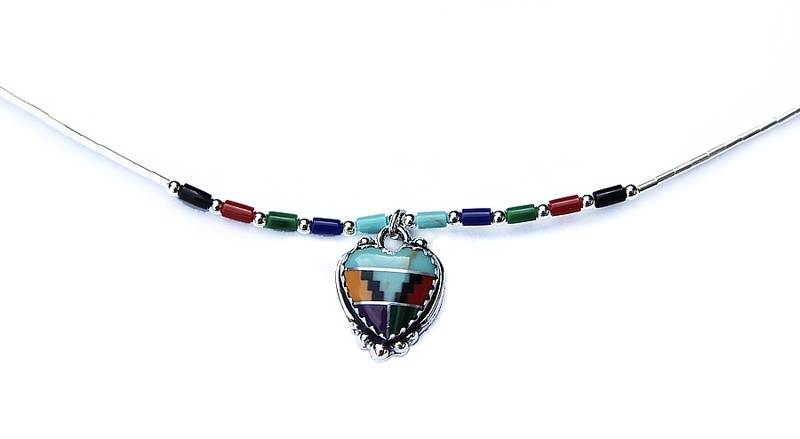 This time Turquoise, Gaspeite, Coral, Amethyst, Adventurine have been mixed together to create a fabulous mega-mix of colours, set in Sterling Silver. As can be seen in this enchanting heart pendant, the results are divine! The ornate heart, with its scalloped edges is set on a Sterling Silver border, with 5 globes emphasising the point. The "chain" is liquid silver, enhanced by semi-precious tubular and globe beads. Length: 41cm (16") Heart: 1.5cm (¾") Matching earrings available.